DREAMS DO COME TRUE….WIN AN ALL-EXPENSE PAID WEDDING! 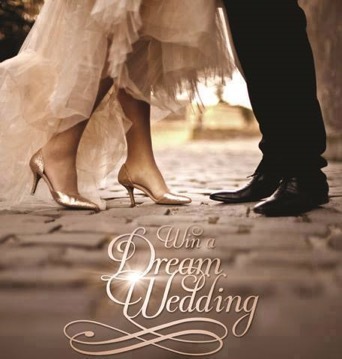 Submit Your Love Story Today & Win a Dream Wedding!! Imagine not having to worry about the huge expenses of organizing a wedding, and having the wedding of your dreams all the same? Yes, you can be that lucky! So, you are getting married! You’ve pictured the blissful experience a countless number of times; it’s something you’ve always wanted. It’s a dream wedding. But the dream takes hard work to become a reality. What about the planning, the expenditure, and all the preparation to look like the bride you’ve always wanted to be? Why enter a wedding contest? Your wedding day is one of the most important days of your life. Not only does your wedding day have huge emotional significance, in contrast it in fact represents months of planning and preparation – and a significant financial cost. Friends and loved ones will be there in order to witness your special day, and the chances are good this you’ll be nervous, excited, and tense over the amount of money you’ll spend. The average cost for a wedding is $40K, some say higher close to $150K. If you factor in the engagement ring, the wedding and the honeymoon, costs escalate. Why not enter a wedding contest and win the wedding of your dreams for up to 200 guests! Here’s what you as a couple need to do to enter: Relate your love story, describe your relationship & state your reason for wanting to participate in this once in a lifetime opportunity by submitting your video to us. Make it fun & be creative. The Giveaway Package Includes delicious food catered by our grand catering sponsor for up to 200 guests. Your precious moments will be captured by JSK Photography with a full day coverage by 2 photographers. The video coverage is courtesy of Motion8films and includes a cinematic highlight video, aerial shot of the venue and raw footage of the events captured. The exquisite bridal trousseau will be provided by VAMA Designs & the jewelry will be courtesy of The Saloni Collection. A suit for the groom with be designed by Project Runway designer JAKE. The mandap for your wedding will be provided by Ajooba Events & décor for your special day will be designed by Prime Party Rentals. Makeup will be done by the talented Vik Bains of Nirvana Creation, hair designed by Monica Nasiri of Fancy Salon and intricate henna design by Neeta’s Mehendi. A cake will be perfectly crafted by Bake Me Something. DJ, lighting & sound will be courtesy of DJ Salim & the couple will get one-on-one first dance choreography by Mona Khan Company Instructors. Additionally, an exclusive feature of the couple & their wedding will be featured in the Indian Wedding Magazine! PLEASE NOTE : Initial voting is based on the number of likes your video gets. So, the earlier you submit your “story” the better your chances are of winning this amazing WEDDING GIVEAWAY CONTEST!